A few episodes ago, I made the observation that the consistency of Grimm is the reason why the show has remained a sturdy performer over the years. 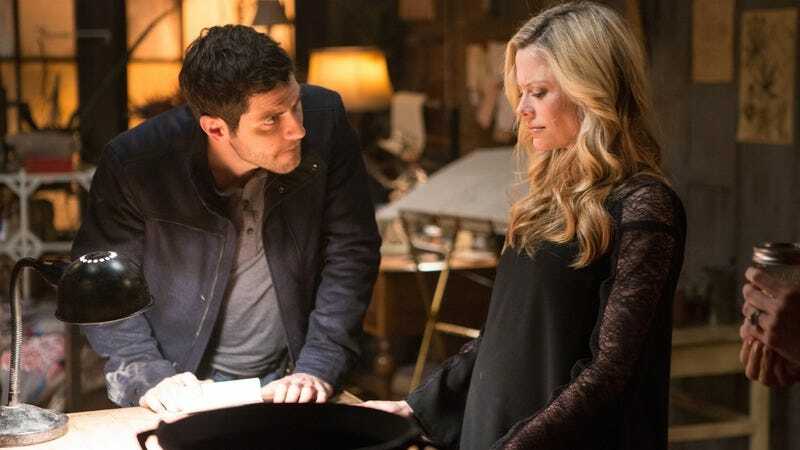 Yet there’s a dark side to that statement, in that Grimm’s faults are as consistent as its strengths—more to the point, its two most problematic characters, Juliette and Adalind, have always been its most problematic. Juliette has long been without purpose, kept in the dark about the Wesen world in season one, trapped in an dead-end amnesia plot in season two, and struggling for relevance in much of season three. And despite early promise as an antagonist Adalind’s spent over half her time feeling like she’s part of a different show (one set in Europe by way of cheap green screen), reacquiring her powers or negotiating terms with royals. The fact that the show has gone the distance it has in reversing the roles of the two women is a large part why Grimm now feels like it’s growing in the right directions. 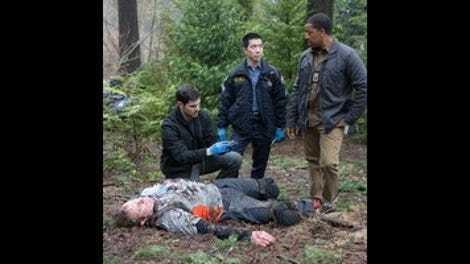 After “Iron Hans” burned down literal and metaphorical links to Grimm’s past, “You Don’t Know Jack” doubles down on those moves by further pushing Adalind and Juliette into their opposite camps. And for the second week in a row, those moves feel like the right moves, as it’s another exciting and captivating episode that’s a cut above most of what’s come yet this season. One of the most rewarding parts of this arc has been that the Grimm writers’ room has finally reached a point where they have to acknowledge that Adalind is a much better character when she’s interacting with the rest of the cast. Her early scenes with Rosalee are loaded with the years of distrust built between her and Team Grimm, but show that a thawing could be possible as they get the chance to discuss the way things went after Diana’s birth. And while things certainly aren’t okay with Nick, there’s a growing sense of detente as he moves to keep her safe from Juliette’s anger, one where if you squint the outlines of protective expectant father are visible. The reactions feel natural and adult, rather than ones drawn out from trying to second-guess the other person from half a continent away. It also helps that despite all the seriousness going on “You Don’t Know Jack” is a remarkably funny episode of Grimm. Longtime Grimm writers Sean Calder and Michael Golamco embrace the macabre humor of the whole Hexenbiest suppressant brewing process, from Monroe’s attempt to excuse himself (“Me? I’m vegan!”) to their increased disgust at the results. Claire Coffee is the recipient of the best of those lines, as everything she’s endured—losing and reclaiming her powers, giving birth in a remote Swiss cabin, forced into imprisonment by Viktor—appears to have jaded her considerably. Or as she puts it, in perfect deadpan: “Not that easy being pregnant, cutting up your mom, and someone trying to kill you.” It’s a black comedy that Grimm is usually conservative with, and the combination of these elements (as well as some Danny Elfman-esque work on the score) keeps the darkness delightful. At the same time, events don’t shy away from the emotional side of the choices that Adalind continues to make. Her one-sided conversation with her mother’s coffin can be viewed as a bleakly hilarious recap of everything she’s gone through up to this point, but Coffee manages to wring the pathos out of it even as Adalind recognizes the strangeness of the position she’s in. (“Thanks Mom, for being dead when I needed you the most,” about sums it up.) And even though it’s a suppressant rather than a permanent removal of her powers, the fact that Adalind is willing to test it on herself—particularly given the exhaustive hassle it took getting them back in the first place—speaks volumes as to how scared she is and the degree to which this isn’t one of her usual scams. Despite a track record that puts her trustworthiness on the level of venomous snakes and Westeros politicians, her choices make a future where she pulls a Spike and winds up one of the good guys seem entirely plausible. However, Adalind depriving herself of her abilities may be the exact wrong decision to make, given that Juliette has pledged her own Hexenbiest powers to the royal side. Her burning of the trailer was an action rooted in personal grief, but allying herself with Kenneth—and giving up details on which of her neighbors may be the most vulnerable—is a move that speaks more of calculated tactics. It would be possible to play up Juliette’s actions over the last few weeks as the Grimm equivalent of being seduced by the dark side of the Force, but what she’s doing doesn’t have the feeling of something she’s going to snap out of the instant her powers are revoked. Like Adalind, she’s making conscious choices, and the more steps she takes in one direction the less plausible it seems she’ll ever get to step back. That option certainly seems forever out of reach with the episode’s final scene, where the cure is offered to Juliette and accepting it is the opposite of what she wants. It’s terrific payoff to the foreshadowing of her group reveal in “Hibernaculum,” where her allocated blame for the way things turned out takes physical form and she turns her powers on the group. Kenneth makes a joke about her burning bridges earlier, and the way she disarms, hurls around, and manipulates the group is the definition of that behavior to an exponential degree. Breaking off a relationship? Survivable. Burning down a trailer and centuries of accumulated lore? Worse, but still survivable. Smashing your one chance at returning to normalacy and forcing your ex-boyfriend to point a gun at his best friend? There’s no walking away from that. Oh, and did I mention that Jack the Ripper is also in this episode? Yep, the Gothic air that the various witchy brewings lend to the episode is amplified by the appearance of a heavy London accent and a string of prostitutes turning up dead with throats cut and organs removed. While the episode doesn’t need a monster-of-the-week with everything else going on, it does add a degree of urgency to things as the investigation continues to demand more and more of Team Grimm’s attention, and also adds a degree of mystery by keeping glimpses of the killer limited to first-person perspectives. And the final scene—where Hexenbiest scholar Henrietta becomes the killer’s latest victim—implies further repercussions to the Grimm world that goes beyond cutting up a few streetwalkers. It’s almost surprising that Grimm has taken this long to go to the Jack the Ripper legend, given its tendency to cannibalize stories across time and culture. In this context it works, as the atmosphere of “You Don’t Know Jack” is steeped in enough arcane elements that the reinterpretation of him as a potentially centuries-old possessive spirit fits. Plus, it’s not like ideas of possession are outside of this universe’s scope. Remember the Greek coins that drove people crazy? (Wait, on second thought, don’t remember those coins. They were the worst.) In any case, it’s a heightened move that fits into the heightened tone of the episode, even if everyone is a little too quick to reach it as the conclusion. Given how obviously “You Don’t Know Jack” is established as a two-parter—ending on a Breaking Bad-style cliffhanger as a gunshot happens the second after things cut to black—it remains to be seen just how far Grimm is willing to go in tearing up its foundations. Taking a shot at Monroe pushes Juliette beyond the point of redemption, and the more she’s pushed the more it turns out that’s exactly where she should be. Grimm’s consistency may have served it well over the last few years, but the tremendous levels of energy it’s getting out of challenging those conventions is so effective that one hopes we reach a point of no return. Well, not one that kills Monroe of course. That’s just crazy talk. This Week In Portland: Both of the dead girls turn up in the vicinity of Union Station, and for once Grimm cites a street location (Couch and 3rd) and it’s the right intersection. Grimm pays a proper homage to Aunt Marie’s trailer in the opening scene, with all four male members of Team Grimm reliving their early experiences with the trailer via flashbacks and the somberness of the score. And with several of the books and weapons (including Monroe’s beloved “ogre gun”) surviving the fire and relocated to the spice shop basement, it looks like not everything is going to change right away. That being said, many materials are lost to them now, so much so that Nick has to use Wikipedia—oh, I’m sorry, Globe1-search.org—for his cursory research. Juliette and Adalind’s improvements mean that Renard now has the questionable honor of worst Grimm story with his nonstop bleeding and tendency to wake up in swimming pools. Seriously, get on with already. We get our first glimpse of the mayor of Portland this week at Renard’s press conference. And I’ll admit, it broke my heart not to see Kyle MacLachlan creating some Portlandia synergy and filling the role here too.